By the time you first notice bowing or buckling in your foundation walls, it's likely that the problem has been present for a long time. Bowing foundations are often caused by a force called hydrostatic pressure. 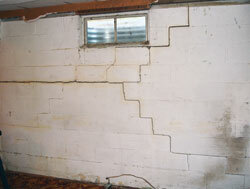 Cracking, bowing, and buckling foundations is a serious problem that should be addressed right away. When you choose to restore your foundation, bear in mind that removing and replacing the foundation is by no means the only home foundation repair option available. In fact, it's usually not the best one! 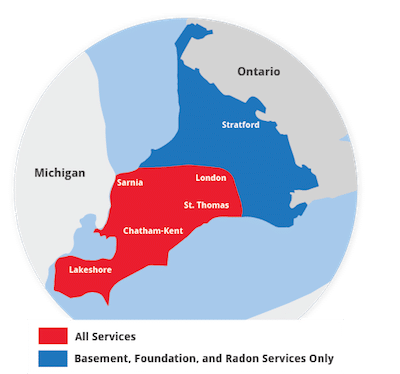 If you'd like a free ON foundation repair inspection and repair quote in London, Windsor, Chatham, Sarnia, Stratford, Windsor , Leamington, St Thomas, Amherstburg, Strathroy, Essex, Ingersoll, Kingsville, Aylmer, Goderich, Hanover, Listowel, contact Advanced Basement Systems of Ontario today! The process begins with your yard. Before replacing the foundation, the former foundation must be dug out and removed. Temporary supports will keep your house raised while the foundation walls are rebuilt. When the work is finally completed, the landscaping and dirt can be returned, and a year later, the soil will need to be regraded. Rebuilding a foundation wall is expensive, invasive, time-consuming, and disruptive to your home. Additionally, foundation replacement merely replaces the damaged foundation with another one- which can fail in turn over time. 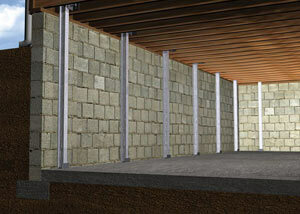 Foundation wall anchors, often installed in the Ontario area, are slightly more effective for bowing foundations. The Supportworks, Inc. Wall Anchor System, provided by Advanced Basement Systems, offers a reliable and solid foundation repair system for the province of Ontario. FSI Wall Anchors include three main components: an interior wall plate, a connecting steel rod, and an exterior earth anchoring system. 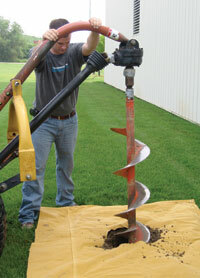 To install a Supportworks foundation anchor, a small area of lawn is removed, and the space underneath is excavated. An anchor is placed inside the hole, and a small hole is created in the foundation wall from the inside. The steel rod - which has no corkscrew end - is pushed through the earth to where the anchor is placed outside. The anchor is fixed on the rod, and the earth is returned and packed tight. The lawn is returned to its original state, and a wall plate is mounted on the steel rod on the inside of the foundation. The wall plate is tightened against the wall, and this tightening is repeated over time. 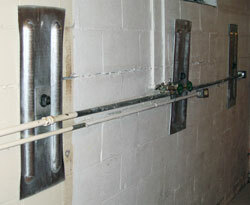 In some cases, a wall anchor system can't be used to repair a bowing wall because the yard outside the house isn't accessible. When we at Advanced Basement Systems encounter this kind of problem, we suggest that you install our PowerBrace™ Foundation Wall System. If you live in Ontario and foundation anchors or the PowerBrace™ are solutions you're interested in, click here for a free foundation wall repair quote from Advanced Basement Systems! Otherwise, click here to learn about crawl space repair, or click here to learn about how to level a foundation!